Prime Minister Viktor Orban's waves during the final electoral rally of his Fidesz party in Szekesfehervar, Hungary, April 6, 2018. Hungarians will vote Sunday in parliamentary elections, polls expect Orban to win a third consecutive term. Outspoken Hungary Prime Minister Viktor Orban ramped up his anti-migrant rhetoric ahead of parliamentary elections Sunday, when the ruling Fidesz party is expected to score a straightforward win. The European Union and the United Nations have voiced alarm at the tone of the campaign, and fears over alleged attacks on the media and judiciary. “Brussels wants to dilute the population of Europe and to replace it, to cast aside our culture, our way of life,” he told supporters in Budapest March 15. 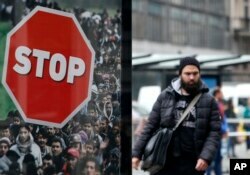 A man walks by an anti-migration billboard from the Hungarian government on a street in Budapest, Hungary, April 7, 2018. Hungarians will vote Sunday in parliamentary elections, with current Prime Minister Viktor Orban running for a third consecutive term. Close to a half-million migrants entered Hungary in 2015 and 2016 at the height of the crisis, most headed for Western Europe. The flow was stopped after Orban’s government erected a border fence. The EU wants all member states to take in quotas of refugees, but Hungary has refused, and Brussels has threatened legal action. The dispute has fueled support for the government’s brand of ethnic identity politics. In an interview for VOA, Hungary’s Foreign Minister Péter Szijjártó said Hungarians do not want a multicultural society. Among the many people the ruling Fidesz party accuses of conspiring against Hungary is billionaire U.S. financier George Soros, a claim he strongly denies. Supporters of Hungarian Prime Minister Viktor Orban are seen before his campaign closing rally in Szekesfehervar, Hungary, April 6, 2018. The opposition accuses Prime Minister Orban of acting like a dictator. “Today, freedom is not in danger because of foreign powers. 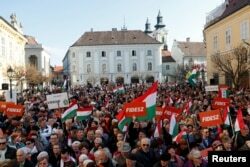 Today, tyranny is coming not from the East, not even from the West, but from Felcsut (Orban’s hometown),” Socialist Party leader Gergely Karacsony said at a recent campaign rally. There is an added unknown quantity in Sunday’s poll. The previously far-right Jobbik party has tacked toward the political center, attracting pensioners with promises of better health care. Many younger people are also turned off by Orban’s agenda. “I think the government does not give enough freedom for thinking any more, and I cannot see my future in this kind of environment,” student Laura Balazs said while attending a recent job fair in Budapest. But with strong approval for his uncompromising anti-migrant rhetoric, Orban looks set for another term in power.